As the sun began to set in Diboll, Texas, on Jan. 3, a precarious scene was unfolding. Two Tar Sands Blockaders were perched 60 feet off the ground in a leafless forest that was just days away from being cleared to make way for the Keystone XL pipeline. 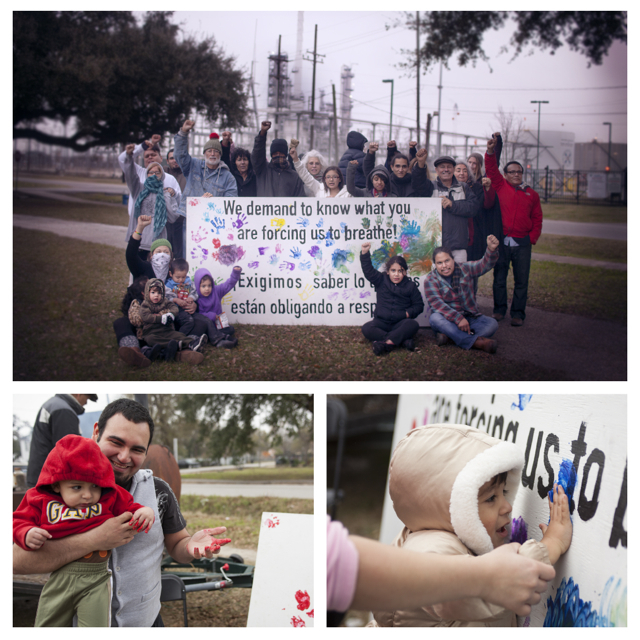 The action, which echoed the revolutionary call issued by the Idle No More movement and offered solidarity with polluted refining communities in Houston’s toxic East End, brought construction to a halt. “Tar sands extraction threatens indigenous sovereignty and our collective future,” said an anonymous blockader who helped rig the tree-sits, which were intricately woven between a railway and a busy highway. While much of the recent anti-pipeline attention has been focused on rural landowners in East Texas towns like Diboll, less than two hours by car to the south of the tree-sit, Tar Sands Blockaders and anarchist community organizers have been cultivating a growing resistance campaign in the Houston neighborhood of Manchester. 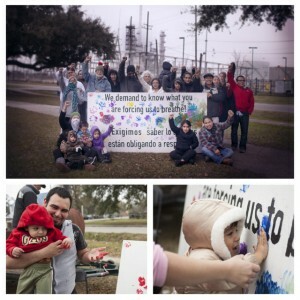 This small Latino community — blockaders prefer it styled as Latin@ to denote gender neutrality — is essentially surrounded by a Valero refinery, which has become a key point of interest among the energy giants due to their commitment to purchase 20 percent of all tar sands pumped through the Keystone XL pipeline. TransCanada, a powerful multinational corporation, has stopped at nothing to build this pipeline, harassing communities all along the 1,700-mile route and using local police as hired mercenaries to deal with the growing dissent. On Dec. 27, residents of Manchester joined together to send a message to Valero: “We demand to know what you are forcing us to breathe!” Valero is just one of the many corporations seeking to exploit tar sands mining along the Athabasca River in Canada, and the company plans to refine these “heavy sour crudes” in the Gulf Coast’s fence-line communities that sit adjacent to pollution-emitting industrial factories. Mining, refining and other dangerous industrial processes are threatening cultural heritage, land, ecosystems and human health. Those most affected by this process are the indigenous communities near the point of extraction in Alberta, as well as the low-income Latino and African American refining communities near the Gulf Coast. Aside from helping to fund what many ecologists and environmental scientists consider to be the most ecologically destructive project on planet Earth, Valero poisons the neighborhood of Manchester day in and day out. Monitors have detected the presence of eight known human carcinogens in the air. Residents suffer from incessant coughs and headaches, while many children have asthma and almost every family has a loved one who’s suffering with some form of cancer or has already passed away. In 2003, Manchester’s air measured an annual average of the cancer-causing chemical 1,3-Butadiene that was 11 times higher than what the Environmental Protection Agency permits for toxic waste dumps. Although Manchester has suffered years of this kind of environmental racism and classism, it was only recently that community members began to take a stand. Their demand — a first of its kind — was issued after a day of activities based on the organizing principles of solidarity and mutual aid, which empowers communities to play an active role in their recovery. 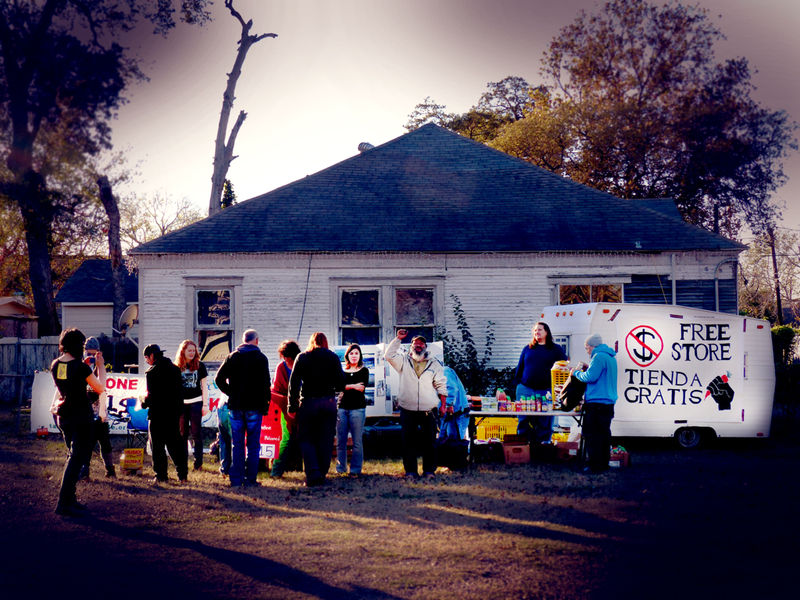 To help provide items that families need, a free store was set up and run by the youth in the community. Tony Diaz, author and founder of Librotraficante, which smuggles banned books on Mexican American studies into Arizona, attended the event and donated hundreds of books to the free store. 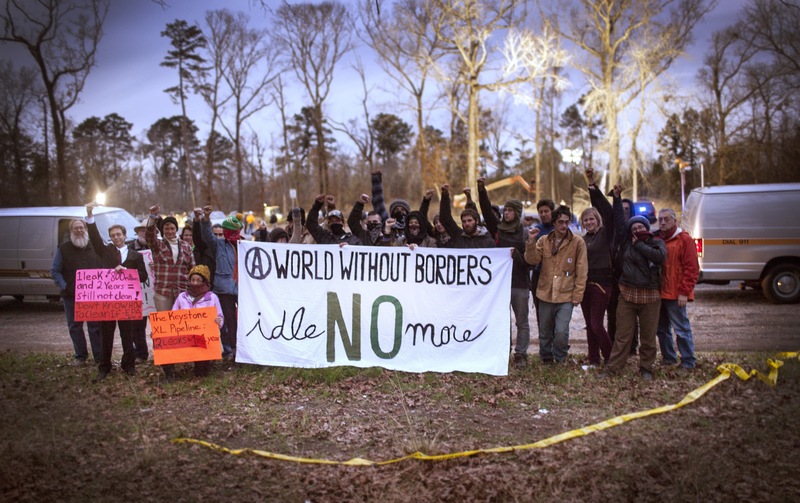 Tar Sands Blockaders collected warm clothing items to distribute, which were donated by friends and allies, including members of the Austin Heights Baptist Church in Nacogdoches, where the last Tar Sands Blockade action camp was hosted. Maria Jiminez, a lifelong resident of Houston’s toxic East End and board member of TEJAS (Texas Environmental Justice Advocacy Services), raised her fist in the air after giving a fiery speech and yelled, “Stand up!” To which the crowd responded, “Fight back!” After a few rounds of chanting, everyone joined together to march the half-block to the neighborhood’s only park, which sits in the shadow of the Valero refinery. Once there, the demand board — which had been painted to say, “We demand to know what you are forcing us to breathe!” in both English and Spanish — was put on display. Standing outside her home, across the street from a massive Valero smokestack, eight-year-old Delilah told media and other onlookers, “I suffer and I cough every time that I go to the park. Valero, stop poisoning our community!” The next day, the demand was hand-delivered to Valero CEO William R. Kleese by a young Manchester woman named Yudith, who bypassed the security outside Kleese’s gated community, leaving a letter on the steps of his multi-million dollar home. None of this happens, however, without the watchful eye of the state. Houston Police Department officers have been seen riding in Valero security cars, harassing residents and questioning them about organizers — some of whom have been stopped and hounded by police on multiple occasions. Diane Wilson and Bob Lindsey, who just ended a 45-day hunger strike to protest Valero’s involvement in the Keystone XL pipeline and the company’s presence in Manchester, gave an interview to Swedish Public Television in Manchester at the site where they locked their necks to industrial trucks in solidarity with the community. The reporters were then swarmed by six police cruisers; officers searched the reporters’ vehicle and detained them for over an hour, underscoring the glaring collusion between corporation and state. Nevertheless, the battle rages on in Texas. Hundreds of protesters gathered under the Tar Sands Blockade banner on Jan. 7, storming the corporate headquarters of TransCanada to air the grievances of all those who will be affected by toxic tar sands exploitation. Blockaders have now even extended into Oklahoma, where ties are being built with indigenous communities whose reservations sit on the path of the Keystone XL. National and global solidarity continues to build as people are coming to the realization that unless they take action now, they will be just as responsible as the TransCanadas and Valeros of the world for the destruction of these communities and the planet. We were notified on Sept 10, 2013 that a rezoning was taking place in Ingleside, Texas (Corpus Christi Bay) to build a refinery. We have not even been allowed to talk at the rezoning meetings.